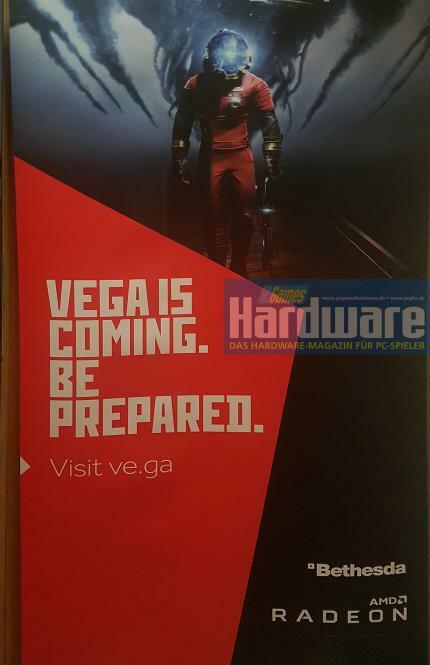 AMD has just teased its upcoming enthusiast Vega GPU in a preview event for the upcoming Prey, a first person shooter from Arkane Studios and Bethesda Softworks. Members of the press were given the opportunity to get a hands-on experience playing a preview version of Prey. The game is reportedly optimized for AMD’s Vega and will take advantage of the architecture’s plethora of new technologies. The demo that a lucky few got to play was also reportedly running on an unreleased Vega GPU. 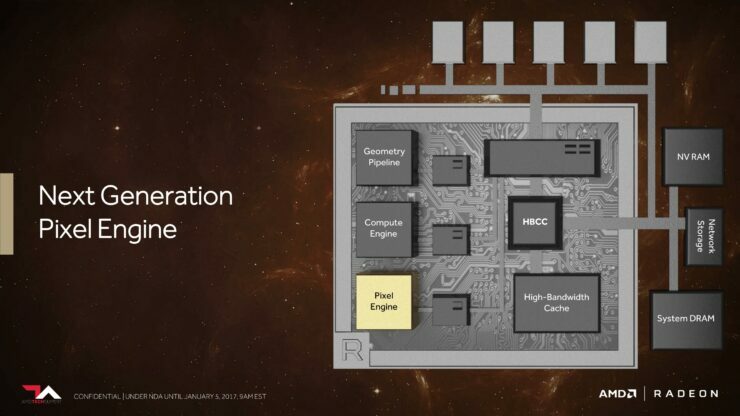 The brand new graphics architecture is set to power the company’s next generation family of high-end Radeon graphics cards. 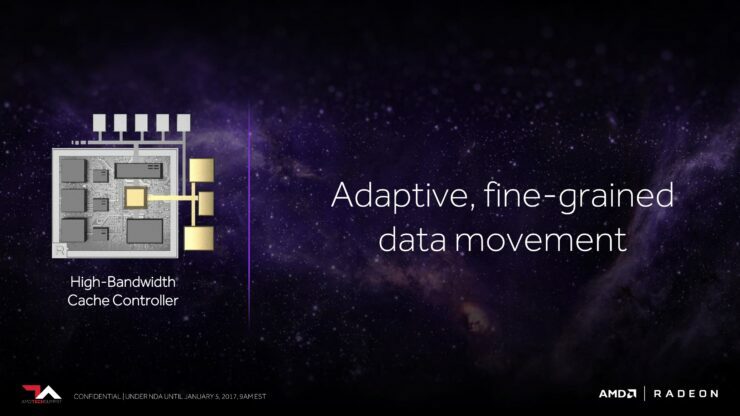 Vega is AMD’s latest 14nm graphics architecture and represents the most significant leap forward for the company in half a decade. The performance demos that the company has showcased of Vega so far have painted a a clear picture of an enthusiast class chip, the fastest that the company has ever built, going toe-to-toe with NVIDIA’s GTX 1080. 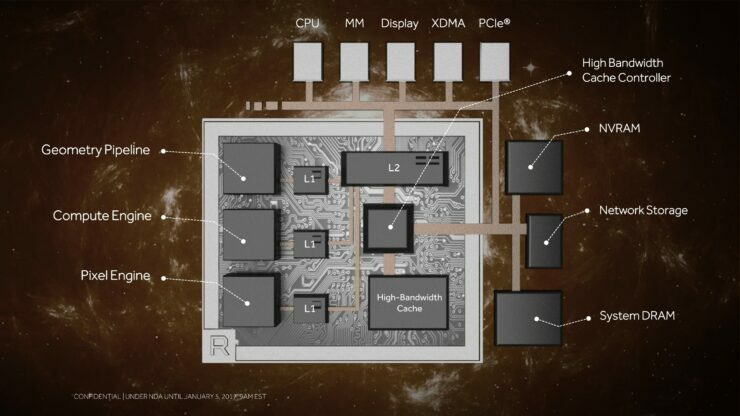 We reported last month that AMD indeed plans to release the first of the Vega lineup in May. After sources in the supply chain revealed to Wccftech that the company has communicated its intent to begin the roll-out of its new graphics roadmap in the middle of Q2. Officially, President and CEO Lisa Su announced that Vega will be released in the second quarter of 2017 without going into further detail, which spans April to June. The Radeon graphics roadmap for 2017 includes both Vega 10 and Vega 11. 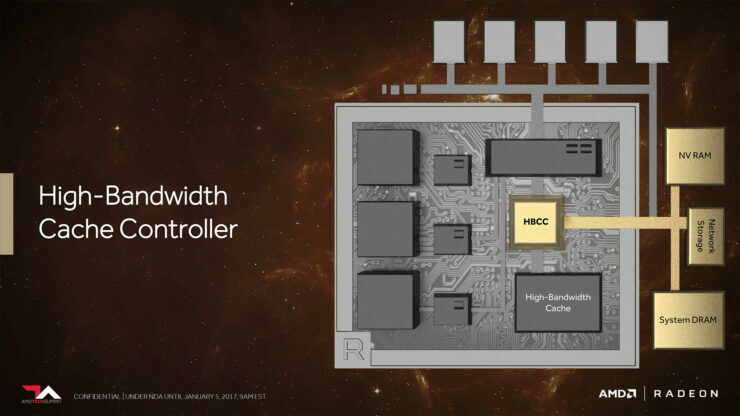 The Vega ramp is planned to begin with the introduction of the company’s new Radeon 500 series flagship Vega 10 GPU first, followed by the mid-range Vega 11. If everything goes as planned you should be able to grab a Vega GPU off the shelves this summer. Interestingly, Prey is slated for release on May 5th. Around the same time, likely a few weeks before, Vega is expected to be released. This explains AMD’s decision to co-market with Arkane Studios as it stands to be strategically very beneficial. A performance advantage for Vega in a high profile title like Prey can prove to be key in helping the GPU distinguish itself in launch day reviews and improve its overall reception. 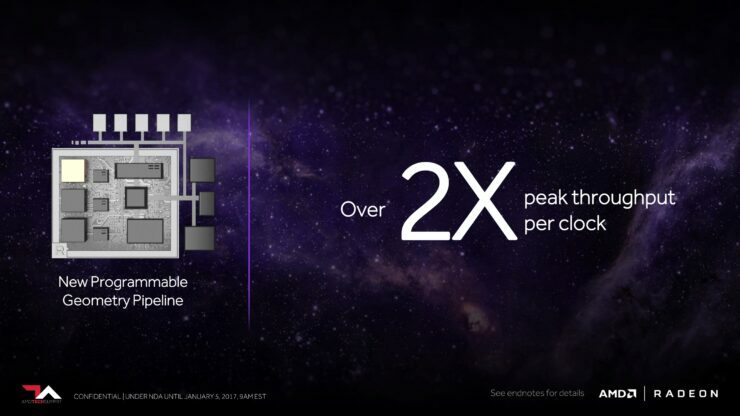 In the meantime AMD has announced an upcoming graphics press event set to take place on the 28th of February. It’s called “Capsaicin and Cream” and it will be streamed live from GDC. There are a few hints that suggest Vega could be part of the show. 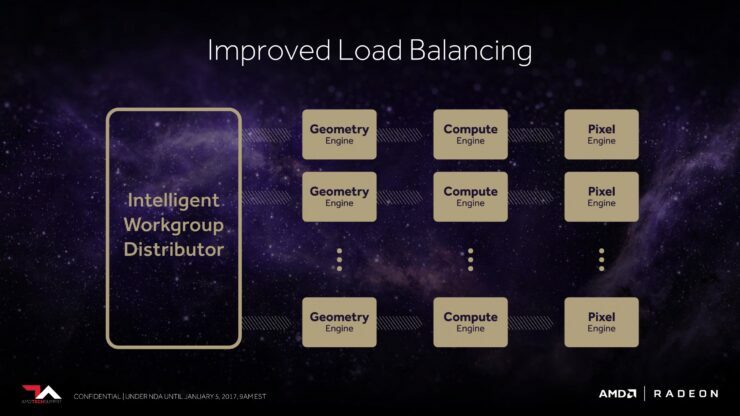 The company has developer sessions scheduled at GDC to talk specifically about Vega technologies and architecture-specific optimizations. 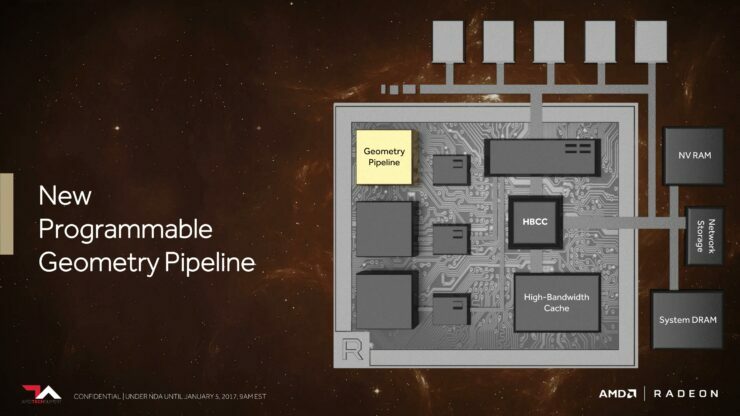 At the company’s previous Capsaicin event in March of last year we got a glimpse of AMD’s as then yet unreleased Polaris graphics architecture. It was a graphics-centric media event which was also live-streamed. The company’s decision to call its upcoming event “Capsaicin and Cream” could be its way of hinting at a repeat of last year’s successful event. Another important report about Vega that we’d be remiss if we failed to mention comes via bitsandchips.it. 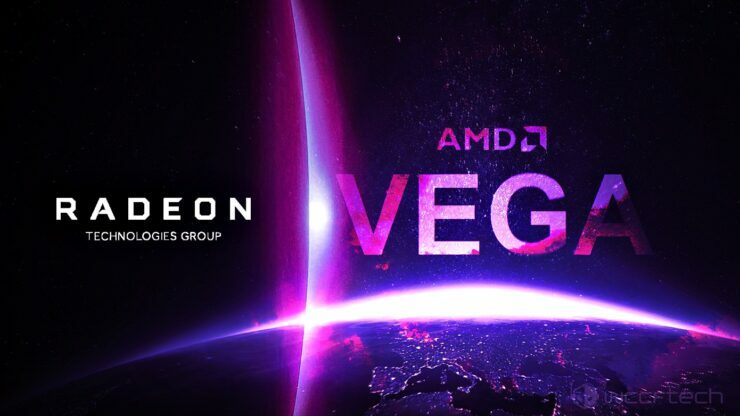 Which states that the Radeon Technologies Group is devoting an extraordinary amount of attention and resources to making sure Vega drivers are on-point on day one. This is in an effort, bitsandchips.it explains, by the company to maintain the growing positive image it has created around its new software ecosystem. Beginning with multiple significant overhauls that it has introduced over the past couple of years. In December of last year it introduced the Crimson ReLive special edition driver package, which was part of an annual Radeon tradition that involves releasing a massive feature-packed driver release as a holiday gift by the company to its user base every December. In 2015 the company completely overhauled the UI and graphics drivers for Radeon users replacing Catalyst with Crimson. The year prior, Radeon users received another mega driver update, called Catalyst Omega. Hopefully the on-going effort will translate to rock solid stability and competitive performance on launch day. 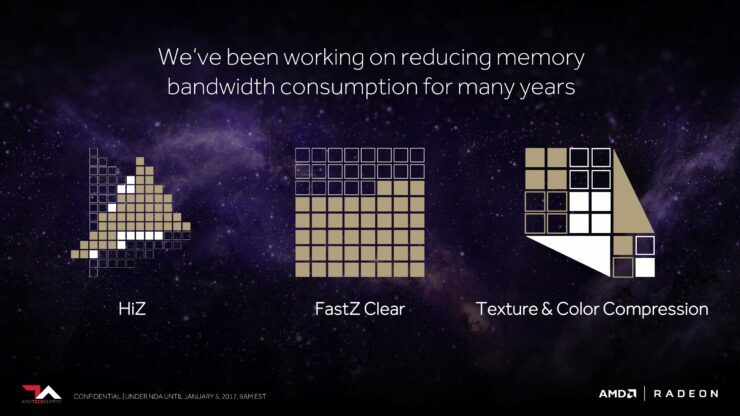 The first is memory capacity, which was confirmed at December’s Vega demo event. 8GB of HBM2 memory for the “consumer” i.e. gaming version of Vega 10 and 16GB for the professional deep-learning MI25 variant. 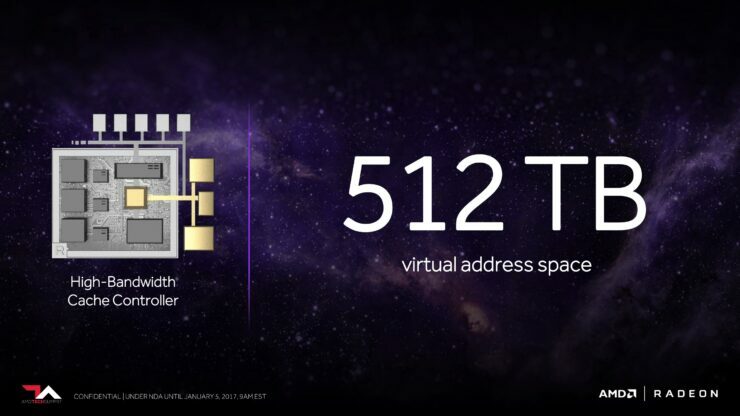 Another key specification that was slipped is memory bandwidth, which stands at 512GB/s. 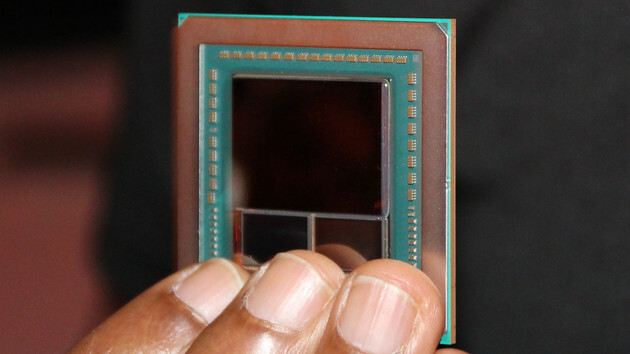 The memory capacity and bandwidth are clear indications that Vega 10 has a 2048-bit wide memory interface. Half that of its older sibling, Fiji. 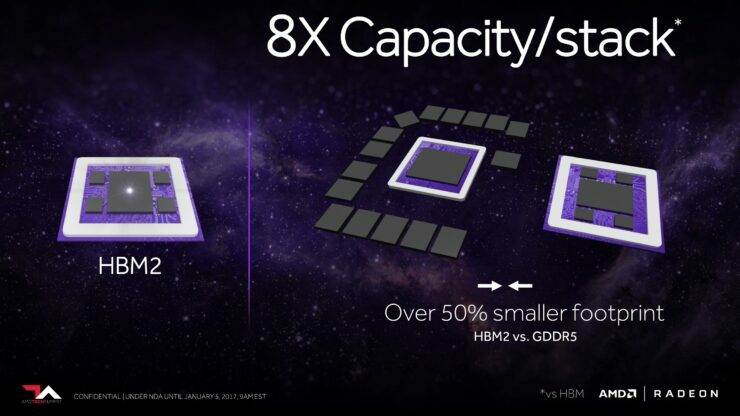 However, because HBM2 is rated at twice the speed of HBM1, Vega 10 is able to achieve the same 512GB/s memory bandwidth figure. 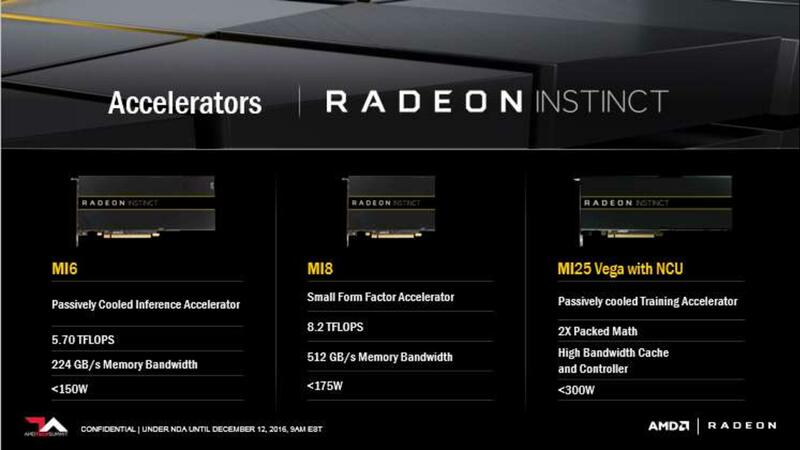 In terms of graphics horsepower, the Vega 10 powered MI25 accelerator is rated at a staggering 12.5 TFLOPS of single precision floating point compute and double that in half precision FP16 compute. 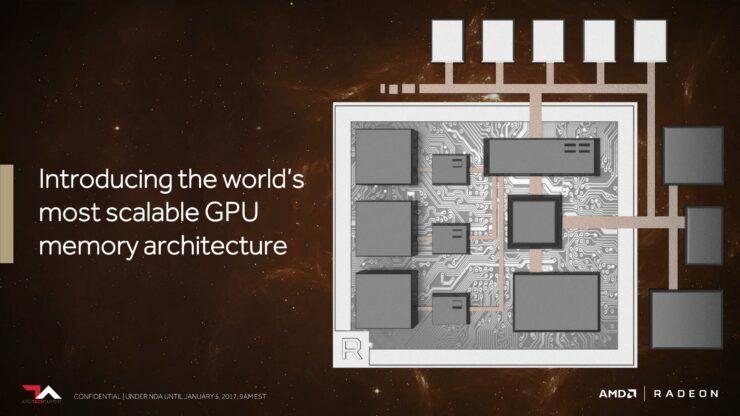 That’s 1.5 TERAFLOPS more than NVIDIA’s Tesla P100 accelerator, powered by the monstrous 610mm² GP100 GPU. The MI25 is a professional, passively cooled product. 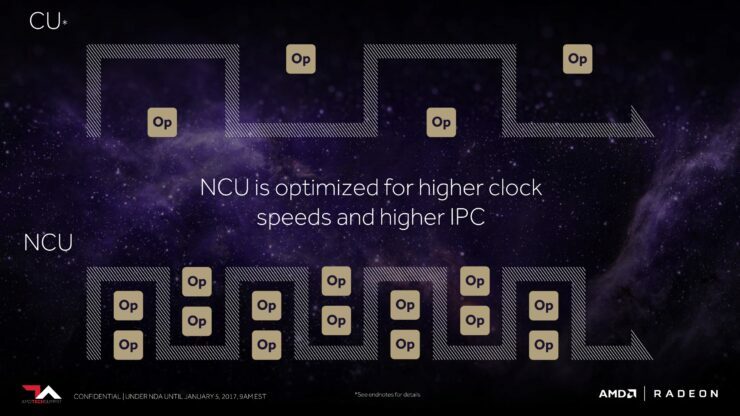 The gaming oriented variant of Vega, equipped with more aggressive cooling solutions and running at higher clock speeds, would naturally be expected to achieve an even higher figure. Another confirmed Vega spec was actually buried deep in the side notes of AMD’s architectural deep-dive presentation. 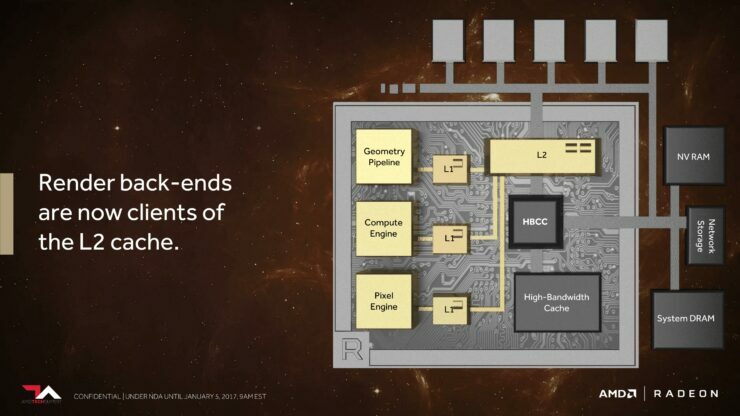 One note in particular referenced Vega’s 64 compute unit engine, confirming that it has a total of 4096 GCN stream processors, a figure that was leaked early last year via the LinkedIn page of an engineer.